The first case was reported on September 22 in Bayelsa, and according to the Nigeria Centre for Disease Control (NCDC), 74 suspected cases have been reported across 11 states including Rivers, Akwa Ibom, Ekiti, Lagos, Ogun and Cross River. The states worst hit by the disease includes Akwa Ibom, Bayelsa, Cross River, Delta, Ekiti, Enugu, Imo, Lagos, Nasarawa and Rivers. 1. 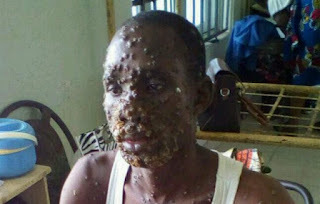 Monkey Pox occurs sporadically in some remote parts of central and West Africa. It was first discovered in monkeys hence the name, Monkey Pox. 5. The symptoms of Monkey Pox are similar to but milder than the symptoms of smallpox. Monkey Pox begins with fever, headache, muscle aches, chills, and exhaustion. The main difference between symptoms of Small Pox and Monkey Pox is that Monkey Pox causes lymph nodes to swell while smallpox does not. The incubation period (time from infection to symptoms) for monkeypox is usually from seven to 14 days, but can range from Five to 21 days. Within the first three days or more, after the appearance of fever, the patient develops a rash, often beginning on the face then spreading to other parts of the body. 7. Monkey Pox can be transmitted from human to human through physical touch, contact with stool, blood contact. Avoid contact with animals that could harbour the virus – including animals that are sick or that have been found dead in areas where Monkey Pox occurs. 10. Vaccination against smallpox has been proven to be 85 per cent effective in preventing Monkey Pox in the past but the vaccine is no longer available to the public after it was discontinued following global Small Pox eradication in 1980.